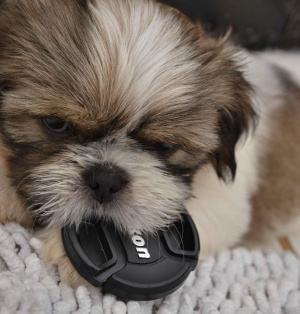 Is your puppy chewing on your carpets, furniture, clothes and more? If so, the good news is that he's a perfectly normal pup...... but you do need to discourage this behavior to protect her, and your home/belongings! Chewing just comes naturally to your puppy. It helps keep her little teeth clean, exercises her jaws, reduces teething pain and (in her opinion anyway) is just good, clean fun. Unfortunately, realizing that this behavior is normal doesn't make it any less frustrating. Especially when you find her chewing the heel clean off your last surviving pair of shoes! 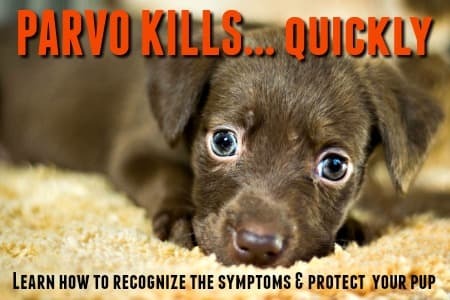 For the first 4 or 5 months puppies chew as a way of exploring their environment and surroundings - much the same way as human babies go through a stage where they're unable to resist the desire to put everything in their mouths. 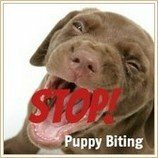 As their baby teeth grow in and then start to fall out, to be replaced by their adult teeth, chewing and biting seems to reach a peak... it's a normal puppy teething stage, but it can definitely be challenging! Young puppies aren't deliberately disobeying you, or intentionally choosing the most expensive chair in the house to use as a teething ring. They're just trying to satisfy their overwhelming need to chew; and if your Persian rug or favorite leather jacket is the nearest, and most attractive, proposition it's going to get teeth-marks on it. If you want to stop your pup chewing her way through everything you own you're going to have to be pro-active. One of the first steps towards putting an end to the destruction, is to start by taking a walk in your puppy's boots! It helps if, for a few minutes, you can try to forget that you're a 5 or 6 foot tall human, and instead pretend that you're a 14" high puppy. When you try looking at your home and surroundings from your puppy's point of view (literally), you suddenly see all kinds of things that you don't want her to see. 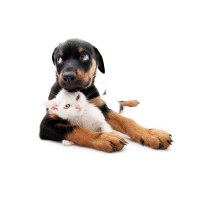 In any home there are tons of things which you definitely don't want your puppy chewing on. Some you don't want damaged, others you don't want to hurt her. Your first step is to take temptation out of her path.... the best way to do this is to check out my Puppy Proofing page. You can buy a spray called Bitter Apple Spray . It's exactly what it says, a bitter-tasting spray that's been specifically formulated to discourage puppy chewing behavior. Puppies are be especially attracted to any item that has the scent of their family members on it. 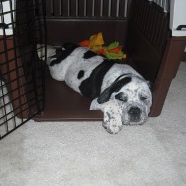 This is why their most favorite puppy chewing objects are often clothes, shoes, hats, pens, purses etc. 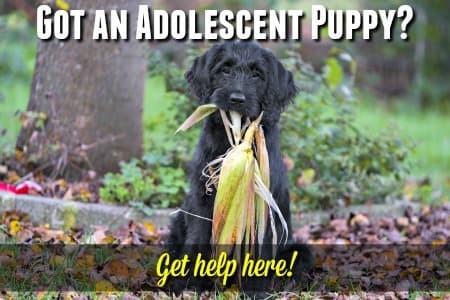 To help your puppy tell the difference between what she can chew and what she can't, make sure not to confuse her by allowing her to chew on old shoes, knotted up socks or your kids discarded soft toys. Remember she's only a baby and can't tell the difference between your old, beaten up running shoe and the brand new Nike's you bought yesterday. Supervision & Confinement Really Helps! Now, even if you've done a great job of puppy-proofing your home you're not done yet. When you're trying to stop a puppy from chewing you have to take a multi-pronged approach, because I can guarantee you that little Fifi will still be able to find some forbidden treasure to chew on, no matter how well you puppy-proof your home. The next step is to make sure your pup is supervised whenever she has free access to your home. This may be a good place to mention that a small puppy should rarely be free to roam around the house, and never be allowed to do so unsupervised. Obviously even puppy parents have lives and you can't be glued to your little furball's side 24/7 so - whenever you can't supervise Fifi make sure she's confined somewhere safe. 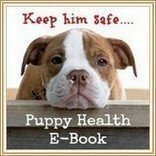 The best option here is often a crate (find out how crate training can benefit both you and your puppy) or you can set up a small exercise pen or playpen. You can even use a gate to keep her in the kitchen with you. Wherever you choose to confine her make sure she has several interesting, safe and durable toys to keep her amused. 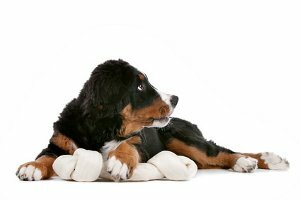 Sturdy Nylabones and Kong toys are a good choice, and there are tons of excellent puppy teething toys on the market. Puppies get tired of the same toys pretty quickly. To keep Fifi interested in her toy box it's a good idea to have a fairly large selection (maybe a dozen or so) of good quality dog toys and swap them out every 2 or 3 days. If you want your little one to have a nice soft, comfy bed to sleep on but she's still in the teething stages, then I'd highly recommend investing in a chew-resistant dog bed (these are pretty much the same thing!). You won't find these in your local pet store, but there are some great choices online and although they're a little pricier than your 'average' doggie bed they will last a whole lot longer... and usually come with a guarantee or replacement warranty just in case your pup manages to damage it. To learn more about these (and see some of the best choices on the market) check out my Chewproof Dog Bed Guide. Okay, so what if your pup is in the living room and you've turned your back for a minute and she suddenly streaks past you with your sons baseball glove clamped firmly between her teeth? First do not run after her - yes I do know how much that glove cost - but that tactic won't work! When you chase your puppy she thinks it's a delicious new game and I promise you she'll be better at 'tag' than you are. Besides, even if you do succeed in catching her she'll be so excited that she'll have death grip on that baseball glove and you're going to be surprised by how much pressure per square inch those little jaws can exert! "Oh Fifi! What have you got there? Oh my goodness, can I see that?" Your puppy will probably come bounding over to show you her prize, her little tail wagging up a storm. Repeat this routine every time she grabs something forbidden. If she's just chewing on a stationary object such as the coffee table. Tell her "No", remove her from it's vicinity and distract her with an interesting toy of her own. Again, if you really want to stop this behavior, you need to do this every time. Puppies learn through repetition, so be firm and consistent and she'll get the message. One more tip - if she's chewing on something hard like a wooden building block, furniture or your hairdryer, replace it with a hard toy such as a sturdy bone or rubber toy. If she has your T-shirt or your daughter's 'Tickle-me-Elmo' replace it with one of her own stuffed toys. Exchanging like for like is your best bet for keeping her busy with her own new treasure.